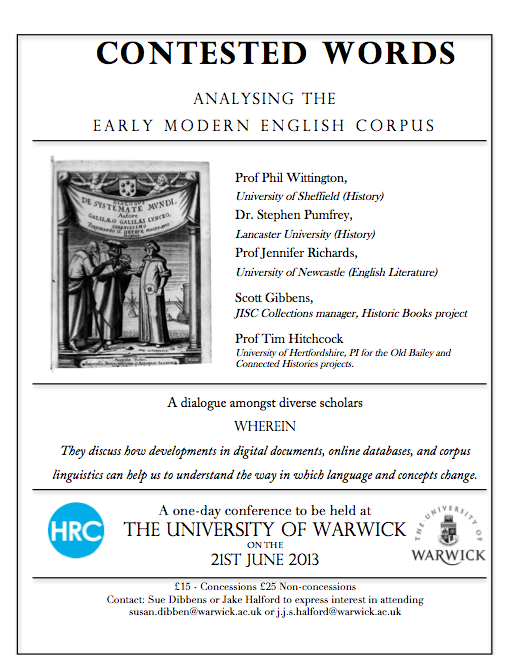 The following is a work in progress poster for a one-day conference I am organising on the 21st June 2013. Digitisation is changing the terrain of scholarship in radical ways: databases such as Early English Books Online and Eighteenth Century Collections Online (and many more) have allowed unprecedented access to texts. But the corpus of digitized texts that we now have available to us allows us to ask new types of questions: how were particular words or phrases used? What words were most associated with each other and did this association change over time? Is it possible to build a collaborative dictionary of key words that could be of use to anyone who works in the early modern period? What methodological implications might such a project have? Was the use of words in printed texts different to that in manuscript ones? This conference will thus look at how researchers can capitalise on the incredible new resources we have by interrogating the corpus of texts. Such an approach will bring together many different types of scholars who use early modern digitized texts. Three important disciplines are History, English and Linguistics (from which the plenary speakers are drawn) but the conference should also have a much wider appeal, to those from Law, Philosophy and Art History, both within and beyond the university. Bringing together scholars with a common interest, who nevertheless do not normally meet, to discuss how they might collaborate is a key objective of the conference. The conference will also bring the academic community together with the providers of digital resources. The Joint Information Systems Committee is developing a new platform, Digital Books, which will enable users to make even more sophisticated searches of the early modern corpus. Similarly, the creator of some key digitized archives, such as Prof Tim Hitchcock, will be coming to talk about the advantages but also the pitfalls of the type of searches that users can perform and the research that he is doing using them. Having discussed methodological issues across different disciplines the conference will conclude with some case studies of contested terms and genres in which a dialogue over key terms was most common. These will illustrate the advantages of the interdisciplinary approach outlined in the previous sessions. The digitization of texts has fundamentally changed the way in which we access and interrogate early modern texts. This conference is an attempt to catch up on the methodological implications of this development, to highlight both the advantages and challenges involved, and to highlight the exciting possibilities of an interdisciplinary approach.